While demonstrating that the analysis of European policy-making cannot be reduced to the national and/or the supranational level, multi-level governance has been criticised for its theoretical softness. Yes, governance in Europe is an extremely complex process and the dividing lines between the various levels involved are blurred, but what does this tell us about the decisive factors in policy-making? The related theory of policy networks endeavours to address this weak spot by breaking up the policy-making process into three systemic levels. 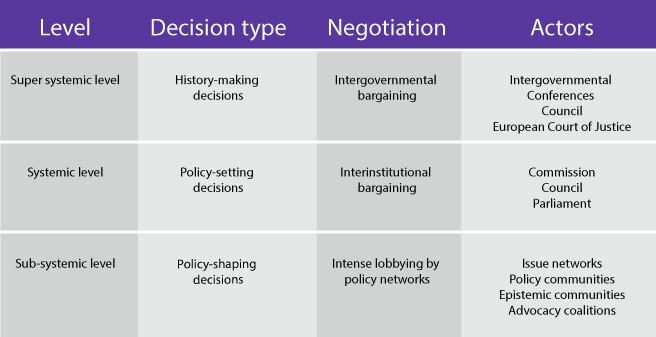 It is only about the lowest of those three levels that policy networks have something to say, but it just so happens that this level decides whether policy initiatives reach the European agenda in the first place. The super-systemic level, where ‘history-making decisions’ are made by intergovernmental bargaining (Intergovernmental Conferences, Council, but also the European Court of Justice). The systemic level, where ‘policy-setting decisions’ are made by inter-institutional bargaining (Commission, Council, Parliament). The sub-systemic level, where the ‘policy-shaping decisions take place’. It is with this level that policy networks are concerned. ‘issue networks’: highly fluid groups that revolve around a specific issue on the European agenda. ‘policy communities’: more stable networks seeking to influence policy over a longer period. ‘epistemic communities’: networks of experts that inform technocratic decision-making. ‘advocacy coalitions’: interest groups chasing more pronouncedly political objectives. One of the good things about the policy networks approach is that (unlike some of the other approaches associated with the governance turn in European Integration Theory) it actually generates testable hypotheses. It suggests there is a correlation between the structure of the policy networks attempting to shape policy and the policy outcome. One hypothesis is, then, that the more integrated and stable policy communities (such as those that have emerged in the pharmaceutical, information technology and automobile industries (Peterson & Bomberg, 2003)) are more likely to block radical change in European politics than the more loosely organised issue networks (Peterson, 2009). In predicting the success any given policy network will have in shaping the European agenda, much also depends on the stature of the European Commissioner or national minister responsible for the relevant portfolio. According to John Peterson and Elizabeth Bomberg, all policy networks need an effective ‘Sherpa’ (2003: 330). If he/she is trusted or highly regarded by his/her colleagues during the policy-setting phase, the policy networks he/she patronises are odds-on to win the day. Policy networks thus provide an interesting way out of the sterile dichotomy between neo-functionalism and liberal intergovernmentalism. By focusing upon the structure of networks struggling to make their mark on policy-shaping, it can explain how and why some outcomes reflect the technocratic concerns emphasised by neo-functionalists while others exhibit the political logic stressed by liberal intergovernmentalists. However, policy networks are by themselves not a theory of European policy-making, let alone of European Integration. To that end, they need to be combined with other theories explaining the higher levels of the policy-making process and will have to address the empirical problem of capturing fluid and fragmented policy networks (for a critique of policy networks theory focusing precisely on this point, see Kassim, 1994).